Reports said the move is to prevent Kanu from fleeing the country should the court decide to revoke his bail. The Nigerian Police has reportedly placed the leader of the Indigenous People of Biafra (IPOB), Nnamdi Kanu under close surveillance. According to Punch, which cited top sources, the move is to prevent Kanu from fleeing the country should the court decide to revoke his bail. 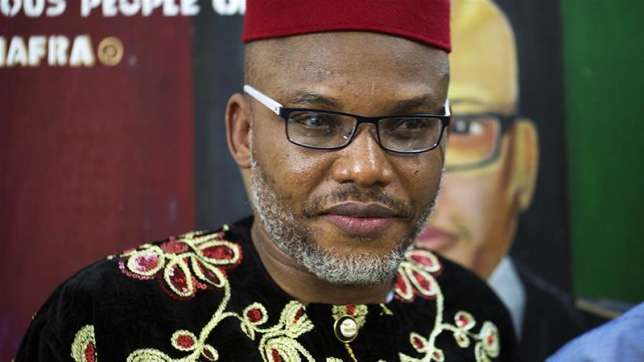 The Federal Government had filed an application before a Federal High Court in Abuja, seeking the revocation of Kanu's bail and his re-arrest for allegedly flouting his bail conditions. The IPOB leader had inaugurated a security outfit, which he called 'Biafra Security Service' - the prosecution said the move constituted a threat to national security. The police public relations officer, Jimoh Moshood, was said to have confirmed that the police has deployed more riot officers in the south-east and south-south regions as part of measures to prevent a breach of the peace which might be caused by Biafran agitators ahead of the upcoming Anambra State governorship election. Moshood, however, did not specify if Kanu is under surveillance to prevent him from fleeing the country. He said: "We have made additional deployments, particularly in Anambra state because of the upcoming governorship election and also to other south-east and south-south states to ensure that IPOB did not actualise its threat of stopping the election. "So also, any pronouncement from the court would be strictly enforced, irrespective of the persons involved. Nobody is above the law, so any court pronouncement would be enforced by the police. "We are not leaving anything to chance; we are to ensure there is law and order and any pronouncement from the court would be strictly enforced. We are watching the situation closely. We have made enough deployments and we are going to act appropriately." Reacting to the plan to revoke his bail, Kanu had threatened that Nigeria will burn if the federal government attempts to re-arrest him. He said he has not committed any crime. According to him, his bail conditions were unconstitutional as it violated his rights to speak, be heard and to associate with people.